Since we moved to Penang, I’ve tried a couple of volunteer works. At the moment, I’m doing only 2 IT related works. One is updating the membership information at IWA, and another is updating the Web site of WCC. Last week, I became a volunteer model. It was for an IWA charity event. It’s always supposed to be a catwalk of all ages but this year, there were more young, slim and tall European and I felt a bit intimidated. 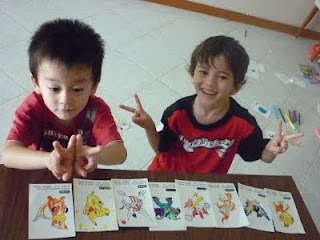 In the last couple of months, Arata has been in colouring. Until recently, he didn’t show interest in it much. On the contrary, Takara has been quite good at it and I’d praised him a couple of times, when Arata became very serious about colouring. In the beginning, Arata tried to follow the colour sample perfectly, if there was any. But he has recently become more free-thinking and creative. He sometimes draws frames around the pictures after colouring them, probably influence by Taska Nania.